I know it didn't close in 1960. I saw Westside Story 1961. Gypsy and Splendor in the Grass there. Yeah I liked Natalie Wood lol. My first solo flight to a movie theater was to the Varsity, to see Help. That was released in 1965. I agree with they previous poster: The Varsity was definitely open as late as ''64. I saw A Hard Day''s Night there too. Soon afterwards, they switched over to foreign films, and art films as they were called. The place was long gone by the late 60s. Good memories. The Varsity was open as of late 1964. I specifically remember seeing A Hard Day''s Night and Blue Hawaii there and that would have been late 1964. It was a fairly nice second-run house and I attended the theater several times throughout my youth. The Varsity was kiddy-corner from the University of Detroit at McNichols (6 Mile) & Livernois. During the time I attended U of D (1979-85) the theater, which was tightly boarded up but still had its marquee, was torn down (along with the entire block of buildings on Livernois) to make way for a new McDonalds restaurant, which we at the university greatly appreciated. The Varsity closed in 1960 or 61. The seats in the Varsity came from the Fisher Theatre when they remodel in the late 50s. Im not sure why the Varsity closed, lease problems, the boiler needed replacing or what ever the cause. Gil Green was the DM for UDT when it closed. Maybe it closed due to the limited parking available. 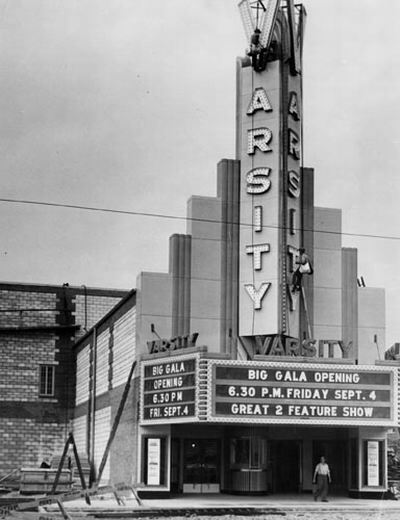 For a time, in the 1950's and 1960's, the Varsity was one of the few 'art' movie theaters in Detroit. They showed foreign films, avant-garde films, and movies that you couldn't see anywhere else. I remember going there several times, with my parents - probably 1959 or 1960. I may have been there in 1965, to see a little independent film called 'The Incredible Goldstein' (listed as 'Goldstein' on IMDB). but my memory is hazy, maybe it was at the Studio North. The chain of Studio theaters took over the 'art' theater niche in the mid-1960's. Dont forget the varsity theatre in Detroit, located on Livernois and McNichols near U of D. I went to many Saturday matinees there for 25 cents. Used to buy root bear barrels fro the machine. I think it finally closed sometime in the 60s.